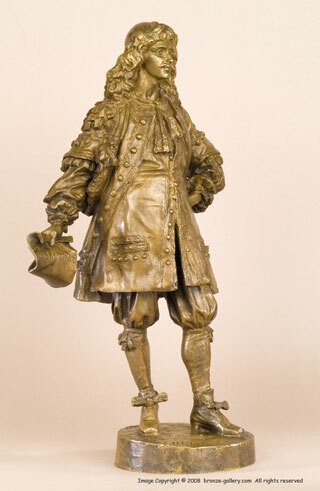 Moliere was the stage name for Jean Baptiste Poquelin who was a 17th century French playwright and actor. He was a traveling actor for some years before he started writing his comedies and satires. Royal patronage helped his career and he became famous and popular. His best known works are Le Misanthrope, L'Ecole des Femmes, Le Malade Imaginaire, and many more. Fremiet has portrayed this famous Frenchman in well dressed form. His hair is well combed, his hat stylish, and he is holding a scroll with "Misanthrope" engraved on it. His clothes are well detailed, even down to the buckles on his shoes. This is a rare model that does not come up for sale often, it is an early cast by Charles More who cast many of Fremiet bronzes. The bronze has a light brown patina which shows the details very well. It is stamped with the punch number "3" and also has the stamp "Tiffany & Co" on the base showing that it was retailed thru the Tiffany stores in the early 1900s. 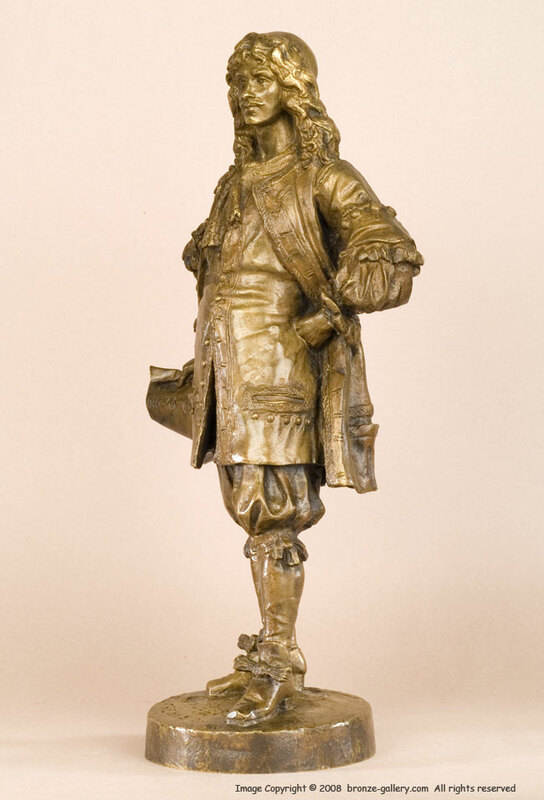 A fine and rare bronze cast in 1875, it would appeal to many collectors.